Hi loves! How are you today? Had a good weekend? I sure did - epic wedding party Friday night, working on our attic on Saturday together with my father, Greek dinner Saturday night with my parents (I ♥ Greek food, it is THE BEST!) and some drinks in the city Saturday night. Today I've been working on the website because next weekend I'll be away to Zürich with the boyfriend! I already showed you 3 out of 6 Art Topcoats I received from El Corazon, and today the other half is shown! I must admit, I had some trouble picking good basecolors for them. If you have any suggestions how I could layer these please let me know in the comments! Again a warning: this glitter looks curly, but isn't, it is reflective. They all felt smooth with a layer of topcoat. Starting with I'm So Different. Red tinted clear base with large hexes in blue and salmon, and small white hexes. This one was layered over H&M Nerd which did alter the basecolor, the red tint is quite strong. The glitter spread easily and there wasn't any placement needed. As with the other 3 I showed you before, and the next 2 in this post, medium sized hexes would make this look more appealing to me. Next up, my favorite of the 6, Knick-Knack. 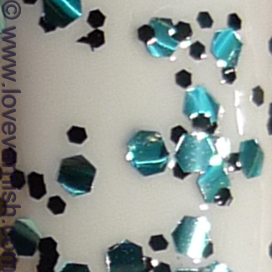 A clear base with small black and large blue hexes. The blue color is the same as in the polish above and Cinderella's First Ball. I layered this one over OPI My Boyfriend Scales Walls, and the combo and contrast was just so much fun to look at! 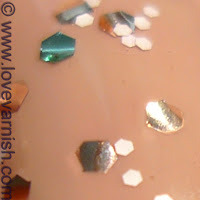 Glitter applied easy, no placing required. Last but not least, Pomegranate Grains. I love pomegranate so much it is becoming an obsession haha! I want to eat it all the time, drink my white tea with pomegranate constantly and every beauty product I see that has this as an ingredient, comes home with me (or wants to). 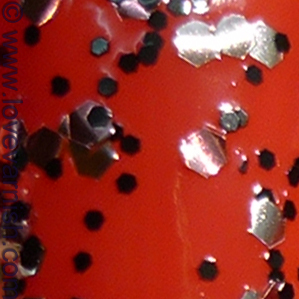 The polish is fun too - again a tinted red clear base, this time filled with small black and large pink hexes. I have a feeling both this one and I'm So Different should have clear bases and the tint is because of bleeding glitter. I can't find enough information though to be sure. This one was layered over ORLY Enchanting, a nice red creme. The pink didn't give as much contrast as I hoped. Same experience with this polish, applied nice and easy! What is your favorite out of the six? And how would you have combined them? I think you picked great base colours! They all make great combos!